Gel Polish - Base 15ml with vitamins - LED 30 sec. - UV Lampa 2 min. Gel Polish - Base 8 ml - LED 30 sec. + UV Lampa 1 min. Gel Polish - Base&top 2in1 15 ml - LED 30 sec. + UV Lampa 1 min. 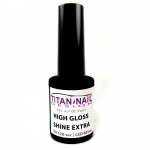 Gel Polish - Base&top 2in1 8 ml - LED 30 sec. + UV Lampa 1 min.